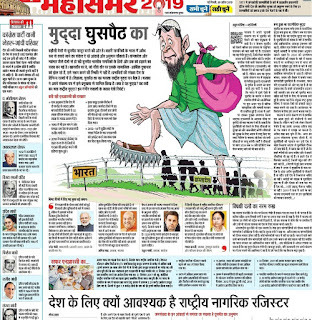 This is just a reflection of how Islamophobia and branding Muslims, goes on in Hindi newspapers in Northern India. This report tells that all 'ghuspaithia' [infiltrators] are Muslim--totally one sided view and peddling the BJP-RSS propaganda. The illustration shows a man who has to 'appear a Muslim'. So this man is shown here wearing a skullcap. He is a Muslim, so he must have a beard and also because the 'Islamic colour' had to be brought, the kurta was painted green. The man shown is poor but still his footwear has nails--for hurting our land! Everything has been done to create perception of an 'enemy'. It is clear cut case of Islamophobia and showing Muslims in a negative manner. Such hate is causing attacks on Muslims. It is high time communal reporting is contained and there is check on it. It is this image of a 'Muslim' that is being persistently pushed into the minds of the people. The paper also goes on to support NRC, though it is not an editorial. The entire page doesn't at all tells why people migrate and why Hindus from other countries are being given preferential treatment in citizenship. For these papers, it is not an issue why people come from Nepal or from other countries. And if at all they come from Bangladesh, what's the reason. For the paper, it's just nothing but taking the RSS line without using any brains. This is horrific level of one-sided propaganda and gutter-level journalism. Further, this is being published just when India goes to polls. Unless people object, raise voice, speak to media house owners, drag them to panels, this won't stop. In fact, his is the biggest threat to Indian democracy. The newspaper owned by Dainik Jagran group. In most cities of MP-Chhattisgarh, it sells as 'Nai Dunia' but due to a 'title issue', in Bhopal, it is called 'Nav Dunia. Terrorists have struck once again--attacking two mosques in Christ Church city in New Zealand, leaving 40 dead. The horrific attack has once again shown that White supremacist terror has emerged as a big threat globally, especially, to the West. The incident occurred at Al Noor mosque in Christ Church apart from Lingid mosque. Armed terrorist stormed inside the mosque on the day when Muslims congregate for special Friday prayer. The indiscriminate shooting led to over two dozen deaths apart from many injured. Police say it was a coordinated attack, hunt on for other suspects. Security has been provided to all the mosques across the country. Initial reports said that four persons have been arrested. 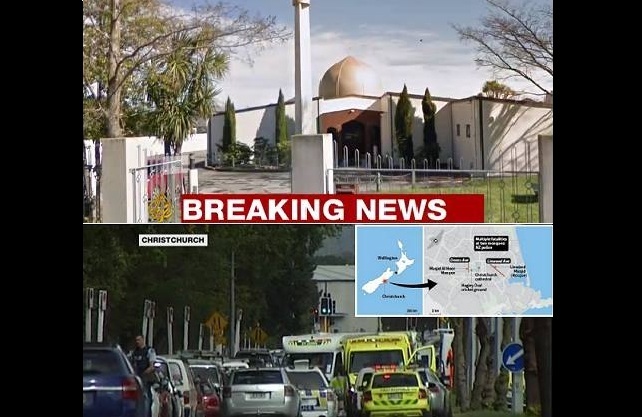 One of the darkest days in the history of New Zealand, says New Zealand Prime Minister after terror attack at mosques in Christ Church. The Bangladesh cricket team was in the mosque but the members survived this terror attack. Even more surprising is that the suspected terrorist live streamed the entire attack with the camera fitted in his helmet. 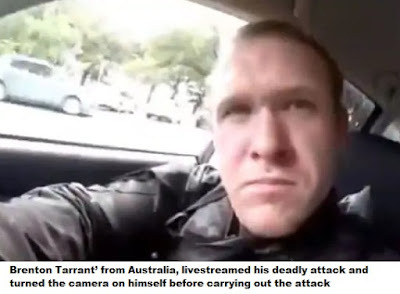 Media reports say that, 'The gunman who livestreamed himself opening fire on a Christchurch mosque has posted a manifesto online explaining why he committed the attack'. READ: White supremacist terror emerging as a global threat to security, especially, in the West. It is another hearing story. 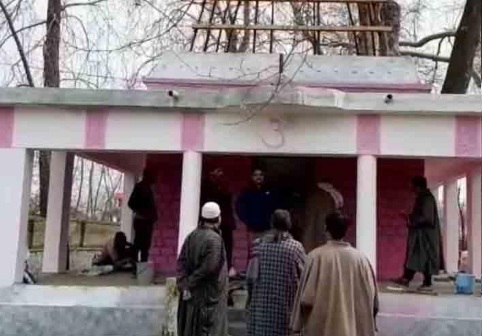 Kashmiri Muslims helping restore an old temple so that the Kashmiri Pandits can worship, there. This is happening in Achan village in Pulwama. Local Muslims have joined hands with their neighbours to rebuild the Shiva temple. The chairman of the local Waqf committee, Nazeer Mir, said that the Kashmiri Pandit family wanted the temple to be restored, so that devotees can again come here and worship. In the past, people came from far and wide to pay obeisance at this temple. But after militancy began, the situation changed. Most of the Pandits had migrated from Achan, years ago. The lone Hindu family in Achan wanted temple to be restored and hence local Muslims took up the task. Got Rs 4 lakh sanctioned from the district administration. They hope that the temple that was neglected for long, would be read soon for the devotees. A report in The Tribune by M Aamir Khan mentions that, "This temple is famous for a spring that changes colours and devotees from all over the country used to come here". Mohammad Yunus, a member of the Auqaf Committee, said they wanted that the temple bells and ‘azaan’ (call for prayer) were heard together at Achan. “It is our wish that Pandits return and live together with us like before. Though the restoration work started in August last year, it had to be stopped in the winter due to heavy snowfall. 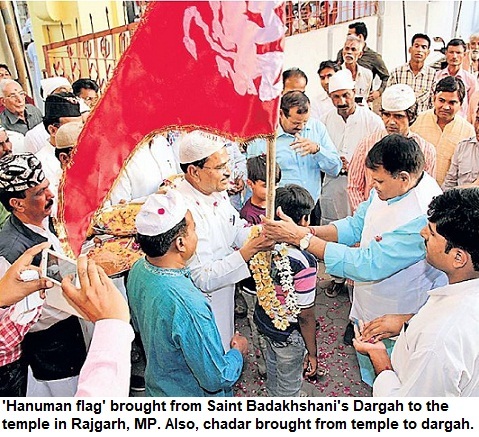 By summer, we are hopeful that our village will hear the ‘azaan’ and temple bells together,” he said. NDTV report by Nazir Masoodi quotes Bhushan Lal, "Our neighbours who are Muslims are doing it because they respect this temple". His younger brother, Sanjay Kumar, said it's their Muslim neighbours who are more important to them than their relatives who have migrated from the village. He said it's not just restoration of the temple but they take care of everything in most troubled times. "We live here like brothers and the Awqaf committee helped us in its restoration" said Mr Kumar. Once again, a lynching bid in Rajasthan. And once again, it's Alwar, the most notorious place as far as cow vigilantes' terror is concerned. It's here that Rakbar Khan was set afire when the accused' kin shot a video. 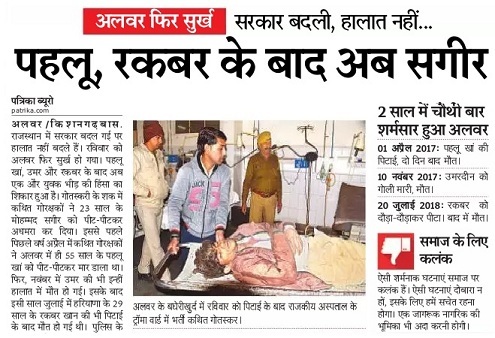 It was in Alwar that Pahlu Khan was beaten and he died. And, it is the same place where Umardeen was shot dead. Cow vigilantes' terror continues in the region. So what if the regime has changed! Self-styled 'cow vigilantes' have the power to stop and thrash anyone without any fear of police. Mohammad Sagheer was suspected of involvement in cattle trade. Hence, he was beaten up brutally. This incident occurred in Bagherikhurd in the district. Sagheer is admitted in the hospital. Police sources said that his condition is serious but improving. Under BJP rule, Rajasthan witnessed series of lynchings and cow vigilantes' lawlessness. Rajasthan's reputation was hit as a result of these killings and terror. Now, Congress is in the power. Will it bring the law-and-order in control? It is the Congress' responsibility now. After the administration forcibly stopped Namaz in parks in Noida, several companies have showed a great gesture. They have made provision that Namaz can be held on Friday in the premises of these companies [or factories]. Hindus largely supported Muslims, realising that the community members pray on Friday in congregation and due to lack of mosques in the area, often find a place where they can pray. There was condemnation of the order. Worse, local officials ordered to pour water on the ground where Namaz is held so that people couldn't pray. In such a situation, Hindu community decided to take a stand. Many officials said that they would ensure that the Muslim employees don't face the problem. Ironically, the news about this gesture didn't get much coverage in the newspapers and Hindi dailies printed single column news. The owners said that Muslims have been allotted space. At some places on premises on the ground, at other places on the rooftop. They have also said that they would ensure arrangement of Imam. This is a story that needs to be told. When people care for each other, it helps in building a strong nation. [Harmony exists all around us but is often ignored. Instead, stories of hate, discord and communalism get spread easily. There are a million examples in our daily lives across India but they don't get promoted, hence, news of hate and discord gets heard more. Let's change it, now. Yet another police personnel has been killed in Uttar Pradesh. Suresh Vats was attacked in Ghazipur, and he succumbed to the injuries. The attackers wanted to go to Prime Minister's rally and were stopped on way. Vats who was in security duty, was returning when he was targeted and got a fatal injury. This resulted in his death. The Nishad Sena members were allegedly involved in the incident that occurred in Ghazipur. Vats was posted in Karimuddinpur police station, but hailed from Pratapgarh. This is the second incident of a policeman killed in UP, recently. 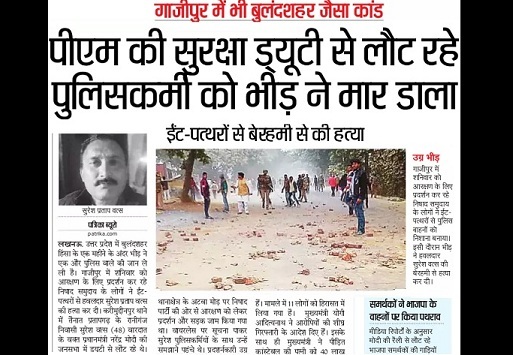 Inspector Subodh Kumar Singh, was killed in a violent attack by right-wing radicals in Bulandshahr. In that case, all the accused are yet to be arrested. Unfortunately, such incidents create short outrage and are forgotten, soon. Most of the incidents have a 'news value' of barely a day or even a few hours--6 hrs or 12 hrs. So much is happening regularly that it seems no one is now shocked anymore. There is condemnation, then demands for compensation or job for kin. If there is no strong protest, it is all forgotten affair after headlines in the morning paper.